Hospitality trends come and go. Some leave too soon, and others are welcome changes. The whiskey category finally overtook vodka sales in the U.S.; kale is still delicious, but all things kale—from chips, smoothies, dips, salads, and kale dessert—are coming to an end; Siracha is soon to be replaced by Harissa for spicy condiments; and real butter is back—no more spreadable plastic pretending to be better for you folks. Let us all say it together: BUTTER IS BETTER! Nationally and in many local communities, the government has started the conversation about tipped employees and how they are compensated and taxed. Highly educated people are becoming cooks and are expecting wages that do not fit in the current restaurant business model. Many municipalities and states have increased the minimum wage for both non-tipped and tipped employees. Some top-flight restaurants have gone to a ticketed system where you book a reservation like an airline and prepay for your table. The more desirable the dining time, the higher the cost, with a 20 percent service charge included. We are seeing lawsuits all over the country. Applebee’s servers sued over non-tipped hours worked, time spent folding napkins, polishing silverware, and other auxiliary work that is performed day in and day out to ensure proper service to generate tipped income. Mario Batali’s Batali and Bastianch Restaurant Group, just one of many to lose class action lawsuits in last couple of years, had to pay servers over five million in wages this past year. All of this has led to the discussion: Is tipping obsolete, and are cooks unfairly paid for their skill set? The gap between what cooks earn compared to servers has always been wide (many times servers wages can double and even triple what the cooks earn). With the cost of goods increasing and food costs going up, which is driving up check averages, the gap is getting even wider. A little secret: the more expensive the restaurant, usually the less the cooks make. As the saying goes for cooks, “If you can afford to eat at the place where you cook, you probably aren’t at that good of a spot.” All cooks know what we are getting into when we walk into the kitchen. It is a career in which you must be passionate, driven, and a bit of a masochist to succeed. Why am I even discussing this? Why is this important? Because this industry is changing and the hospitality industry is the second largest profession in the United States only behind working for the government. I know we are only serving food. We are not curing cancer, developing renewable resources, fighting pollution, helping the homeless or anything else as virtuous, but we do provide a living for a whole hell of a lot of people out there. 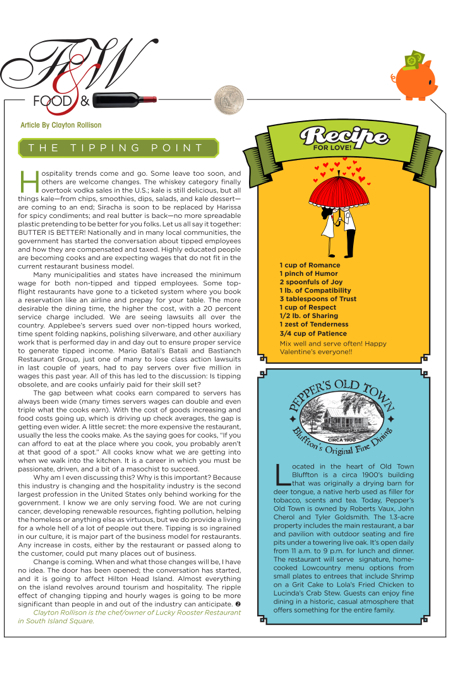 Tipping is so ingrained in our culture, it is major part of the business model for restaurants. Any increase in costs, either by the restaurant or passed along to the customer, could put many places out of business. Located in the heart of Old Town Bluffton is a circa 1900’s building that was originally a drying barn for deer tongue, a native herb used as filler for tobacco, scents and tea. 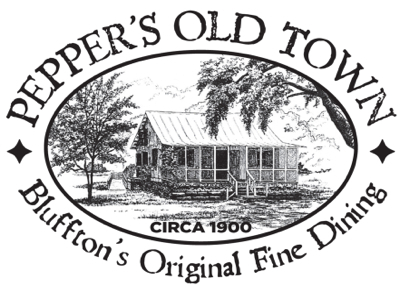 Today, Pepper’s Old Town is owned by Roberts Vaux, John Cherol and Tyler Goldsmith. The 1.3-acre property includes the main restaurant, a bar and pavilion with outdoor seating and fire pits under a towering live oak. It’s open daily from 11 a.m. to 9 p.m. for lunch and dinner. The restaurant will serve signature, home-cooked Lowcountry menu options from small plates to entrees that include Shrimp on a Grit Cake to Lola’s Fried Chicken to Lucinda’s Crab Stew. Guests can enjoy fine dining in a historic, casual atmosphere that offers something for the entire family.